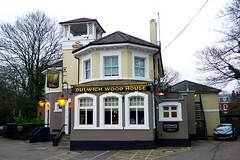 Young's pub in Sydenham, previously known as the Dulwich Wood House. It was refurbished in May 2015, adding a conservatory extension to the existing bar and seating area. There is a huge beer garden sheltered by lovely trees and hedges, but bafflingly covered with astroturf. The food menu is very gastro-ish, with main dishes around £12-£14, starters around £4 (as of June 2015). After a previous refurb, Matthew Black visited in November 2008 and found that the formerly cosy front section is now a restaurant and devoid of all its previous charm. A cappuccino was £2.75. Kat and friends visited early on a sunny Saturday evening in June 2015. It was quite busy, although most of the patrons were outside in the beer garden (including a baby shower party with around a dozen children under 10). The conservatory area was pre-laid for table service. While the beer was well-kept (£3.70 for a pint of Young's Bitter), our food experience was less than impressive - a wrong dish was brought out (fish pie rather than fish & chips) and after looking at the card receipt it turned out we were overcharged by £1.50 as well. Pork belly (£12) had a decent amount of crackling but not much meat, and there was no carbohydrate included (or any suggestion by the staff that a side of chips might be required). When the fish & chips did finally arrive however, it was fresh and very tasty. Kat's verdict: Overpriced food and, if I'm being honest, a rather surreal and sanitised atmosphere. I'd be unlikely to return, especially on a weekend. Accessibility: Several even steps at the front leading in to the bar area. Access to the garden from the bar is via several very steep and slightly uneven steps - however there is a wheelchair lift running to one side of these steps. There is also a step free entrance to the beer garden via the car park side gate. Toilets are on the same level as the bar. There are a couple of steps down to the conservatory area from the bar. Child-friendliness: The pub is very much geared for families with young children - according to the pub's Twitter feed there is a 'Yummy Mummy' coffee morning on Tuesdays. There is a buggy park shed by the car park, and a ping-pong table and a giant Connect 4 game in the beer garden. Opening hours taken from the Wood House website, December 2015. Last visited by Kat, June 2015. Last edited 2015-12-02 17:16:34 (version 18; diff). List all versions. Page last edited 2015-12-02 17:16:34 (version 18).